Zplasma, a startup spun out of the University of Washington, hopes that its ability to harness super hot, stable plasma to make light will help the semiconductor industry continue its march to cram more transistors on a chip. Zplasma’s breakthrough is the shorter wavelength of light it can generate using plasma. At shorter wavelengths, the light generated by one of the machines used in making a chip can penetrate deeper into the chemicals deposited onto a wafer and etch finer lines on semiconductors — the finer the lines, the more transistors are able to fit. The industry has determined that the future standard for making microchips will be 13.5-nanometer light, a wavelength less than 1/14 the current size that should carry the industry for years to come. Such extreme ultraviolet light can be created only from plasmas, which are high-temperature, electrically charged gases in which electrons are stripped from their nuclei. 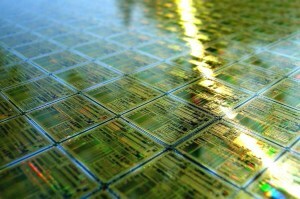 … Light produced through techniques now being considered by the chip industry generate a spark that lasts just 20 to 50 nanoseconds. Zplasma’s light beam lasts 20 to 50 millionths of a second, about 1,000 times longer. The technology produces finer lines, and the longer amount of time that the light is on is key in moving the wafer down the chip manufacturing line. It’s the difference between a dot matrix printer and a laser printer in terms of speed. The UW report notes that Zplasma is looking for additional investment from someone or an entity that understands the industry, and explains the tech in more detail. Or you can watch the video below. I find myself intrigued by the idea of harnessing plasma for extreme ultraviolet lithography, although other technologies such as nano imprinting may also become the successor to etching, despite the billions invested in extreme ultraviolet lithography. Plus, the etching issue is only one of the problems that faces the chip industry as we attempt to cram more transistors onto the wafer. The leakage of power from one closely packed transistor to another is a problem, as are the on-chip communications between more transistors. So while this tech looks pretty cool — really, anything involving superheated plasma is pretty cool (or hot) — it won’t cure all the woes of chip firms trying to keep Moore’s Law — which says that the number of transistors on a chip will double every 18 months or so — alive. But at least it joins the ranks of those who are trying.